If you, like me, have never assembled an engine before or handled a piston, you would have never thought that those little dinky piston rings are engineered for a very specific orientation on the piston. Let's review using this naked piston as a reference. 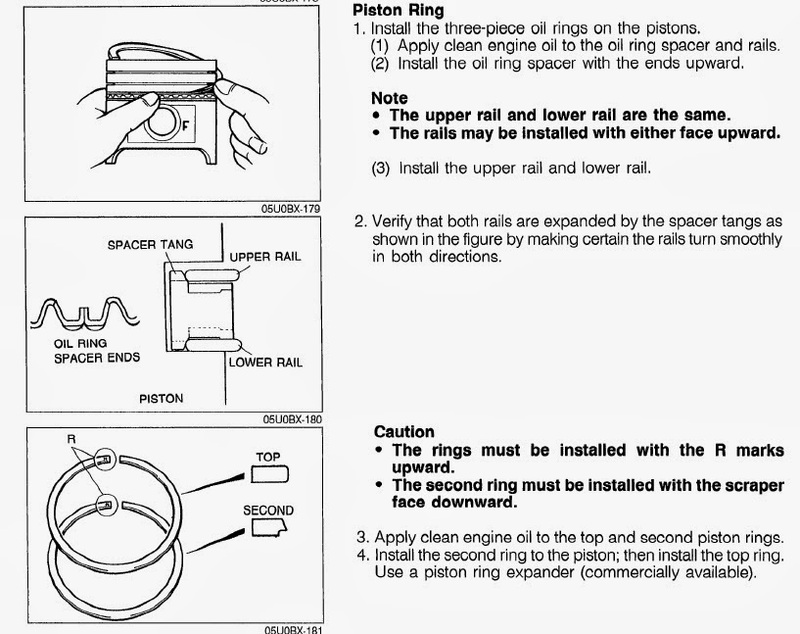 The bottom most set of rings are the oil control rings. As I understand it, the purpose of the oil control rings is to retain a little bit of oil to lubricate the piston to cylinder wall during the up and down stroke. This bottom most ring is actually 3 pieces. The second or middle ring is the 'scraper'. It scrapes the side of the cylinder of oil to keep it out of the combustion chamber - the semi-circular, bowl shaped area between the top of the piston and the bottom of the valves. It is OK for oil to be present in the cylinders up to this point but not above. If oil makes it to the combustion chamber that means that the piston rings are sealing properly, results in low compression and the oil dilutes the combustion and results in blue smoke out the exhaust. The top or first ring is the compression ring. It is responsible for compressing the air from the intake manifold with the fuel being injected from the fuel injectors while the spark plug ignites the mixture and creates the big boom that forces the piston back down the cylinder and makes the engine run. Thankfully, I got this sorted but lost a week which means delays when I can get started racing again. I'm enjoying the engine build but tripping over this was annoying. Regardless, thanks to friendly Miata people posting on Miata.net and the guys at Mazda Motorsports, this mystery was solved. The oddest part is that we couldn't even see a bevel or taper in the top / first piston ring. 3 of us tried to find some sort of mark that would distinguish which was was up or down but we couldn't. The top set of rings did have one obvious visual marking - a white paint dot - but no mention of how this paint mark relates to orientation can be found anywhere. The only time I was able to visually see the beveled /tapered edge on the inside of the first ring was when I stacked a couple of rings together and held them over a white background like in the picture below. If you look close enough, it looks like there may even be a smaller bevel on the bottom side of the piston ring also. Either way, I wound up installing the top ring with the white mark on the right - which placed what I thought was the most noticeable beveled / tapered side upward. With this mystery sorted, I was finally able to start assembly and I made great progress! I'll make another post on that in the next couple of days. Hope this helps someone else out in the future.